Everything about this movie was good. 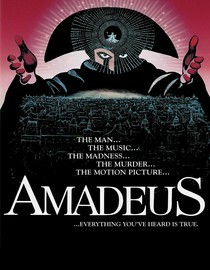 The acting was superb, particularly from F. Murray Abraham who gave a brilliant performance as Mozart's rival Salieri. The plot was wonderful and made you think about the nature of talent, art and why some people are born with such great natural talents and others aren't. Although clocking in at 3 hours long the movie never gets dull and the costumes and music were phenomenal. In short, this is a fantastic movie that explores the dark sides of artists and the creative process in a way that is both historical and entertaining. I never knew Mozart was such a hell-raiser. I need to get a biography on his life and you need to watch this movie. There is a reason it got a boat load of Oscars. This movie will stop streaming on 1/1/2011. Why is it in your queue? I'd heard it was a great movie but never got around to checking it out. Is it artsy? No, but it is about the pains that go with great talent and creating great art. Best thing about the movie? Mozart's creepy laugh. What mood should I be in to watch this movie? Ready to be blown away by great music and acting (and with 3 hours to spare). What rating did you give it on Netflix? 5 Stars.